The biggest shake-up to Harrogate’s rail network in decades has been promised with the introduction of more direct services to London and a move away from outdated ‘cattle truck’ trains. A new two-hourly direct service to London from Harrogate will be introduced from 2019 after it was announced a Virgin and Stagecoach consortium will run East Coast Main Line services. In addition, Chancellor George Osborne promised in his Autumn Statement yesterday that bidders of the Northern Rail franchise will be encouraged to replace the pacer trains with ‘modern, better quality trains’. The news comes just three weeks after news that Harrogate’s railway station would receive a £900,000 facelift for improvements in 2015. Brian Dunsby, Chief Executive of Harrogate Chamber hailed the news as the ‘biggest step of improving transport in Harrogate since the Southern Bypass’. He said: “Harrogate had a special need for these additional services to London as it is a visitor economy and does not depend entirely on business commutes. Commuters in Harrogate and Knaresborough will enjoy an additional six trains a day to and from the capital as well as upgraded train interiors introduced between 2015 and 2017. Virgin Trains and Stagecoach will also introduce high speed IEP trains from 2020, ensuring faster journey times, after being awarded the franchise for the East Coast line on Thursday. Since 2008, extensive research and campaigning from Harrogate Chamber of Trade has been continuing to demonstrate the need for additional open access direct services from Harrogate to London. This culminated in a detailed report submitted to all three bidders of the franchise, as well as the Department for Transport (DfT) and the Office of Rail Regulation (ORR). 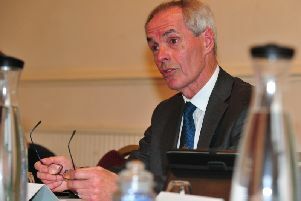 Brian Dunsby, Chief Executive of the chamber, said that eventually the DfT and ORR agreed that Harrogate had a ‘special need’ after ‘demonstrating the demand’ in the town. He said: “We were losing a whole host of exhibitions. Very big events which were coming to Harrogate for years we lost to Manchester or Birmingham for poor connectivity and we could not compare to these other cities. “It was absolutely magic when we secured the deal. Our businesses and the leisure attractions will benefit massively but so will our residents. “They will go to London for a day for their leisure activity and come back and visit friends. It also opens up the international holiday market . The improved connectivity links will replace the current evening return service available to commuters and Visit Harrogate’ Mike Newby, said there will be a noticeable tourism benefit for the town. He said: “The more you can say that it’s easy to get somewhere the easier it is to market it. Those arriving from abroad into the country can now see there is a world outside the city of London. “The new links help us to build on the success of the Tour de France because internationally, they have seen what a fantastic place Harrogate it and we have showcased that to everyone. Harrogate and Knaresborough MP, Andrew Jones, also welcomed the introduction of additional London services and believes electrification of the line will be the next step. He said: ““In a decade we will have gone from having little or no direct service to and from London to at least six direct trains between Harrogate and London. It is important to have these new services for many reasons. “Easy and quick connections always bring an economic benefit with them. These new services could boost business and leisure tourism. “The new services also help strengthen the case for electrification of the Leeds – Harrogate line. While it is important we have these services with modern carriages and facilities, it would be odd to run them on a line which doesn’t enable them to perform at their best. “Only this week we have heard that Northern Rail are investing approaching £1million in Harrogate station. With this new franchise we will see a further investment of £25 in mainline stations. Combined with the electrification programme the government has begun this is the biggest investment in rail since Victorian times. “I am very pleased that Harrogate is getting a significant enhancement to its connections to London.